If your dental professional recommends a tooth extraction, whether it’s because the tooth has become decayed, it’s an impacted wisdom tooth, or more, he or she may suggest tooth socket preservation. As adults, we find tooth removal to be a bit intimidating as we see it odd to be removing a permanent tooth. When a tooth needs to be replaced after extraction, a beneficial way to keep the socket preserved is by using the below procedure to do so. Why Do I Need Tooth Socket Preservation? Many patients are unaware that as soon as a tooth falls out or it is extracted, the socket will immediately begin to close. When a permanent tooth becomes extracted, the dental professional will almost always recommend a tooth replacement option. If the missing space is left unfilled, the jawbone will begin to deteriorate from underneath the empty socket. This is why a dental implant is the highest recommended tooth replacement option on the market. A dental implant procedure requires the dental professional to screw in a titanium post into the jaw bone to mimic a tooth root. When the tooth socket is closed, it can be tougher to insert this titanium post. Having your tooth socket preserved will make getting a dental implant an easier procedure down the line. Not all dental professionals offer this extra step after an extraction, but at Stoner Periodontic Specialists, we are happy to provide the best treatments to our patients. According to the research done by the International Journal of Oral Maxillofacial Implants, it has been found that socket preservation procedure is extremely beneficial to the patient in the long run. A tooth socket preservation helps to maintain the shape of the original tooth root and prevents the reduction of horizontal or vertical adjustments in the alveolar ridge. Socket preservation is a simple – yet important – measure that is taken following tooth extraction. In addition to preserving the space for a future implant, a tooth socket preservation can also help the surrounding teeth to stay in place for the time being. When a tooth is missing in the jaw bone, the surrounding teeth will start to move out of alignment. 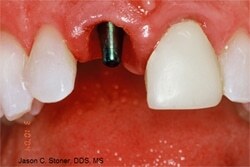 A socket preservation procedure will likely always come directly after an extraction. Call Stoner Perio Specialists today at (614) 392-7384 for your consultation. Let us help you regain the lost confidence in your smile and improve your oral health. Call Stoner Periodontics in Columbus today at (614) 392-7384 for your consultation. Let us help you regain the lost confidence in your smile and improve your oral health. The procedure is relatively simple and typically pain-free. The patient will already be under a local anesthetic due to the tooth extraction and therefore will feel no pain. This is a quick and easy process that is done after the tooth has been extracted and the space is cleaned up. Following the extraction, the tooth socket will immediately begin to close. The periodontist will place a temporary bone graph or dental scaffold material into the socket to preserve its shape. This type of graft can be made from a various amount of material such as real human or cow bone, or synthetic materials. Once the grafting is finished, the periodontist will seal up the graft with a collagen membrane and suture (sew up) the opening. Socket preservation promotes a healthy recovery after tooth extraction, but it also does much more. Cosmetic Benefits – if a tooth socket is not preserved following extraction, the jaw bone will begin to deform, causing permanent aesthetic changes to the patient’s facial structure. Dental Implants – All forms of dental prosthesis require good gum and jaw support. Socket preservation allows for a wide range of tooth replacement options in the future. It is extremely important to follow the periodontist’s rules when it comes to caring for your newly extracted tooth. It is imperative to allow enough time for the tooth socket to heal fully before putting any sort of pressure or strain around the area. We recommend avoiding any tooth brushing for at least 24 hours after the extraction. Even if the toothbrush is a soft-bristled one, it is important to stay away from anything that will accidentally brush away newly formed blood clots. These blood clots are needed for a healthy recovery. If blood clots are stopped from forming, or they are accidentally knocked out- this can lead to a dry socket. A dry socket can elongate the healing time as well as cause extremely bad breath and pain in the area. Be sure to stay away from drinking from a straw, any form of tobacco products, and hard foods for a few days as well. We also recommend tons of rest and no physical activity for the first 24 hours. If you follow all of the above steps, you should be able to recover from an extraction with or without a tooth socket preservation in a week or so. Normal daily activities can resume after the first rest day. Do not hesitate to ask your periodontist about what you may or may not think is OK to do after an extraction. If you notice you are in excessive pain after the procedure, be sure to call our offices for a follow-up check-up treatment. In most cases, our patients will feel likely little to no pain afterward. An over-the-counter pain reliever can alleviate the pressure or soreness you may feel after an extraction. If you have any questions regarding tooth socket preservation, please give us a call here at Stoner Periodontic Specialists. We have our well-trained staff on-hand to answer any and all of your dental questions. Your health and safety is our #1 goal, and we aim to provide that here for our patients. We recommend a tooth socket preservation for anyone looking to replace a newly extracted tooth with a dental implant, bridge, or permanent denture. Call Stoner Periodontic Specialists at (614) 392-7384.